Pioneer Endicott is a 233 unit class-A luxury apartment community. For over a century, these buildings have been one of St. Paul’s most enduring downtown landmarks. Now, this elegantly renovated 16-story complex has been reimagined to meet the needs of today’s resident- all while maintaining its cherished 19th century charm. We offer standard 12 month rentals as well as Short-Term Furnished Corporate apartments. Please feel free to contact the leasing office for more information at 651-789-6632 or by email at leasing@pioneerendicott.com. 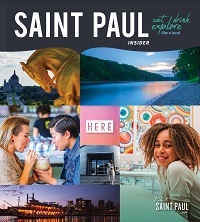 Spend the day shopping in Saint Paul's historic downtown.